During Ignite 2018 Microsoft released a couple of new services and features in public preview for Azure i will try to cover the Governance parts in upcoming posts. Lets start with Resource Graph. If you have been working with Azure Resource Manager, you might have realized its limitations for accessing resource properties. The resource fields we have been able to work with is Resource Name, ID, Type, Resource Group, Subscriptions, and Location. If we want to find other properties, we need to query each resource separately and you might end up with quite complicated scripts to complete what started as simple tasks. This is where Resource Graph comes in, Resource Graph is designed to extend the Azure Resource Management with a Azure Data Explorer Query language base. With Resource Graph it’s now easy to query all resources over different subscriptions, as well as get properties of all resources without more advanced scripts to query all resource separately. Ill show how in the attached examples below. The new “All resources” view in the portal is based on Resource Graph and if you haven’t tried it out yet go check it out. It’s still in preview so you have to “opt-in” to try it. 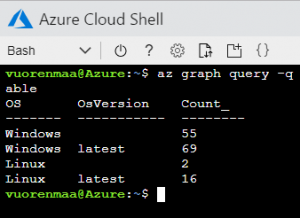 To get started with Resource Graph you can use either CLI, Powershell or the Azure Portal. #Add Resource Graph Extension, needs to be added first time. # Display all virtual machines that starts with “AZ” and ends with number. az graph query -q "where type =~ 'microsoft.compute/virtualmachines' | where name matches regex @'^AZ(. 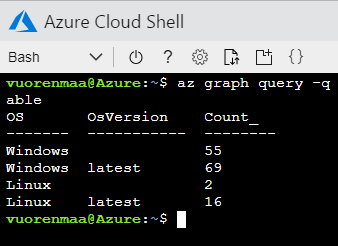 *)[0-9]+$'|project name"
az graph query -q "where type =~ 'microsoft.storage/storageaccounts' | where aliases['Microsoft.Storage/storageAccounts/networkAcls.defaultAction'] =='Allow'| summarize count()"
az graph query -q “where type =~ 'microsoft.compute/virtualmachines'| project OS = tostring(aliases['Microsoft.Compute/virtualMachines/storageProfile.osDisk.osType']) , OsVer = tostring(properties.storageProfile.imageReference.version) | where OS == 'Linux' and OsVer startswith '16.04' | summarize count()"
If you have any specific scenario feel free to contact me and we can try to query your specific needs. You can reach me at tobias.vuorenmaa@xenit.se if you have any questions.